The only bona fide action scene in The Women’s Balcony occurs within in the first 10 minutes. It’s set during an orthodox bar mitzvah in Jerusalem, but the trappings will seem familiar to anyone who’s attended one of these ceremonies in Aventura or Brooklyn or anywhere else: the gregarious extended families, the long-winded sermons, the ancient rabbi, the nerve-rattled boy. Except in this vision of the rite of passage, tragedy preempts the reading of the Torah portion. As the customary wrapped candies rain down on the proceedings, the synagogue’s titular balcony collapses, sending the segregated female congregants scrambling for safety — all but the rabbi’s wife, who falls to the ground floor and into a swift coma. This sounds intense, but first-time feature director Emil Ben-Shimon visually downplays the inciting incident, showing us little of the scraping rawness of life. Brave in theme but bland in execution, The Women’s Balcony is a frustratingly unimaginative comedy about the conflict between control and autonomy in religious institutions; it’s a grand feminist awakening that dons its own headscarf of convention. Like much feminist drama, the film owes a knowing debt to Lysistrata. With their longtime rabbi traumatized and mentally incapacitated from the accident, the faithful enlist the counsel of David (Avraham Aviv Alush), a younger, charismatic, opportunistic rabbi whose piety is rigid and regressive. He promptly orders the male worshipers’ wives to cover their heads, and rather than rebuild a stronger balcony in their damaged synagogue, he constructs what appears to be a holding cell for the congregation’s women, a separate-but-unequal cage with shoddy acoustics. Headstrong and self-determined to varying degrees, the women are splintered by the growing radicalism in their once-unified institution, with Etti (Evelin Hagoel) leading a resistance movement with little help from her go-along-to-get-along husband, Zion (Igal Naor). To her own surprise, Tikva (celebrated comedian Orna Banai) initially dons, and owns, the headgear, while Etti’s nephew Yaffa (Yafit Asulin) finds herself torn between liberal and ultra-conservative religiosity when she strikes up a romance with Naftali (Assaf Ben-Shimon), a disciple of Rabbi David. 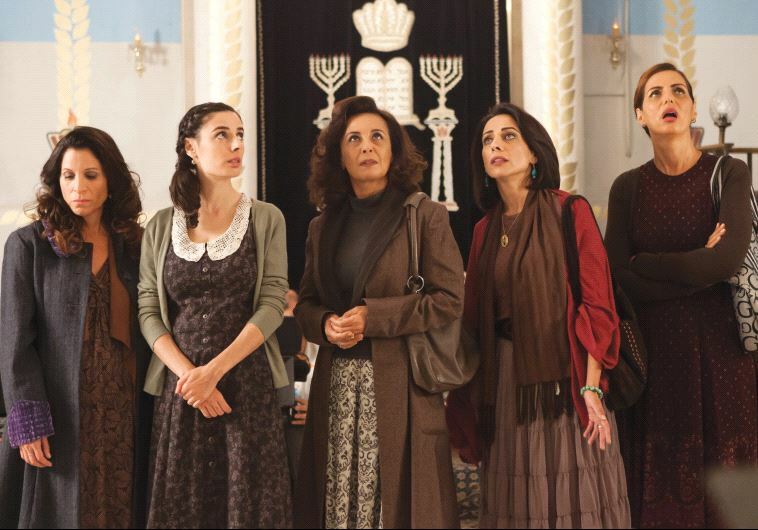 The Women’s Balcony is the rare mainstream film set entirely in the self-contained, and cinematically rarefied, world of Orthodox Judaism. It became the biggest box-office triumph in Israel in 2016, a major accomplishment considering the nation’s secular majority. But the director’s preference for broadness over nuance illuminates little about the people it represents. Its formal approach is pedestrian, its dutiful narrative is ploddingly straightforward, and its humor can be jarringly silly. Rather than craft a three-dimensional antagonist in David, screenwriter Shlomit Nehama’s villain does everything but twirl his mustache. He’s a pure cancer infecting the body of his congregation, leaving all but the most hardline fundamentalist audiences to savor his removal. Of course, this viewership is nonexistent: To this film’s enemies of equality, movies, like dancing and popular music, are anathema to scripture. The Women’s Balcony’s viewpoint is morally sound, but it will only preach, as it were, to its own choir. THE WOMEN’S BALCONY. Director: Emil Ben-Shimon; Cast: Evelin Hagoel, Igal Naor, Orna Banai, Avraham Aviv Alush, Einat Sarouf, Itzik Cohen, Yafit Asulin, Assaf Ben-Shimon; in Hebrew with English subtitles; Distributor: Menemsha; Opens: Friday at Movies of Lake Worth, Movies of Delray, Living Room Theaters in Boca Raton, and Regal Shadowood in Boca Raton, The Last Picture Show in Tamarac and AMC Aventura 24. Actor Itzik Cohen will appear for Q&As at various screenings throughout the region Friday. For information, visit menemshafilms.com/womens-balcony. I think this is the only perceptive, accurate review of this movie that I have seen. It has undeservedly gotten great reviews. It is bland and surfacey and plain boring.